We hope our "Back To Basics" series brings about a change in investors' approach towards investing. The lost art of carefully studying a stock before making the purchase, we believe, needs to make comeback. Understanding the nuances of profit and loss accounts, balance sheets, and cash flow statements has always been pertinent, more now than ever before. So, let's begin the journey to educate ourselves towards a fruitful investing experience. In this series articles, we will try to bring to you the basics of investing by acting as guideposts to unraveling the mystery behind the financial statements. While soft qualitative metrics like corporate governance and management quality will continue to be clouded under subjectivity, our effort will be to arm you with a better understanding of the ways companies can be researched. In this article we shall discuss a very important human tendency that every investor should undoubtedly not avoid. What are the key constituents of an annual report? An overview of the three key financial statements found in annual reports. Understanding and analysing the key operating costs. Learn about the two key depreciation methods and the interest coverage ratio. A brief discussion on dividends, yields and gauging a company's dividend policies. How to go about gauging a company's revenues? Operating margins - What they are and how they differ from one industry to another. A discussion on taxes, net profits and appropriation. A discussion on share capital, reserves & surplus and loans & borrowings - Key liabilities of any company. Current Assets - What Are They? How to go about gauging a company's current assets. What does the company do with the excess cash on books? Is it investing the same wisely? Get to know here. What is the difference between gross fixed assets and net fixed assets? Get the answer here. Understanding current liabilities, working capital and related important ratios. A brief discussion on some of the most important financial ratios that every investor must be aware of. Is the company actually making money from its core operations? Get the answer to this question here. This section discusses how a company goes about funding its operations. Where is the company investing its money? Is it acquiring plant and machinery or is it parking the same in other investments? A discussion on some of the key ratios related to the cash flow statement. As compared to a manufacturing company, a bank/ financial institution reports its P/L statement differently. Learn about the same here. A brief overview on the 'capital and liabilities' side of a bank/ financial institution's balance sheet. Some of the key ratios that an investor must know relating to a bank/ financial institution's balance sheet. Read about some of the important parameters to gauge the performance of a bank/ financial institution. An overview on the asset side of a bank/ financial institution's balance sheet. 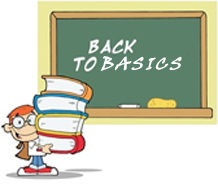 Did you find our Back To Basics series helpful? Tell us!